GermGuardian was initially conceived as a way to provide a powerful air filtration process for the kind of super-affordable air purifiers sold in both developing and developed countries. But today, we will look further at their latest product, the Smart air purifier flagship of one brand in this GermGuardian CDAP5500BCA Review. The U.S firm Guardian Technologies is famed for their low-priced and highly competitive air purifiers, and their UV air purifier technology has traditionally led the budget charge. As the latest Smart member of this growing family, GermGuardian CDAP5500BCA comes hot, especially when you can get a great deal and push the price even lower. Now, let’s walk though this GermGuardian CDAP5500BCA Review (or GermGuardian CDAP5500WSP Review, if you prefer the White version). At the time of writing there’s one great deal on the U.S availability or pricing, but even at the original price tag of $249, GermGuardian CDAP5500BCA still offers some premium features which we can’t ignore. This is Guardian Technologies’s big effort to break into the smart air purifier market, and push itself from being one the largest air purifier manufacturer in North America by the end of 2018. You can get this air purifier for only $199, making GermGuardian CDAP5500BCA one of the best under $200 air purifiers. Trading off the Smart features for the fan power, you can get the GermGuardian AC5900WCA at the same price. If you’d rather spend money for a Smart air purifier, you can choose between the Blueair Sense+ and Honeywell HPA250B. Other potential candidates to compete with this air purifier doesn’t have the proper Wifi connectivity, like Levoit LV-PUR131, Winix 5500-2, Winix 5300-2, Winix C535, or the AeraMax 300. Moreover, you can find an even better deal in the link below. GermGuardian CDAP5500BCA 4-in-1 WiFi Smart Air Purifier, Air Quality Monitor, Voice Control, HEPA Filter, UVC Sanitizer. The flagship of the king of low-range air purifiers market. With a reasonable discount. This air purifier has a White version, named GermGuardian CDAP5500WSP. It stays the same specifications with the Black version, and can be bought from the link below. Also, if you are looking for a GermGuardian CDAP5500WSP Review, our today review is still appropriate. The GermGuardian CDAP5500BCA design is pure GermGuardian. Its predominantly plastic design is always at its best when compared with other high-range premium materials. Moreover, it doesn’t feel cheap and nasty, instead we can see a sleek design and a luxury black color. This is essentially the exact same GermGuardian design as the previous AC4300BPTCA, CDAP4500BCA, AC5300B and AC5350B, at least in terms of their looks. From the front, it’s something of a smart circle which is actually the LED indicator for current air quality in your room – the Smart Air Quality Monitor (or AQM) of GermGuardian. From the back, you will find the chunky air intake grill. However, I personally don’t like the position of this air purifier’s grill. With an air flow from the back to the front, it is difficult to find a good spot in our home to put this GermGuardian CDAP5500BCA, as it will somehow decrease the polluted air input. On top, we will have a neat control panel, with 5 function buttons. GermGuardian CDAP5500BCA make this panel as minimalism as possible, but still have enough information for any users. Being the flagship of GermGuardian’s tower air purifiers, this 28-inch GermGuardian CDAP5500BCA unit is only 11.6 lbs. Apparently, you can put this air purifier anywhere in your home. To decide the power of an air purifier, basically we will look at how many filters it has and what types of air filters are used. Being a GermGuardian air purifier, you will expect no less than a top performing 4-stage air filtration process as below. Pre-filter – This filter is including Activated Carbon Filter to be able to remove the large particles of pollutants and reduce odors created from smoke, cooking, and pets. 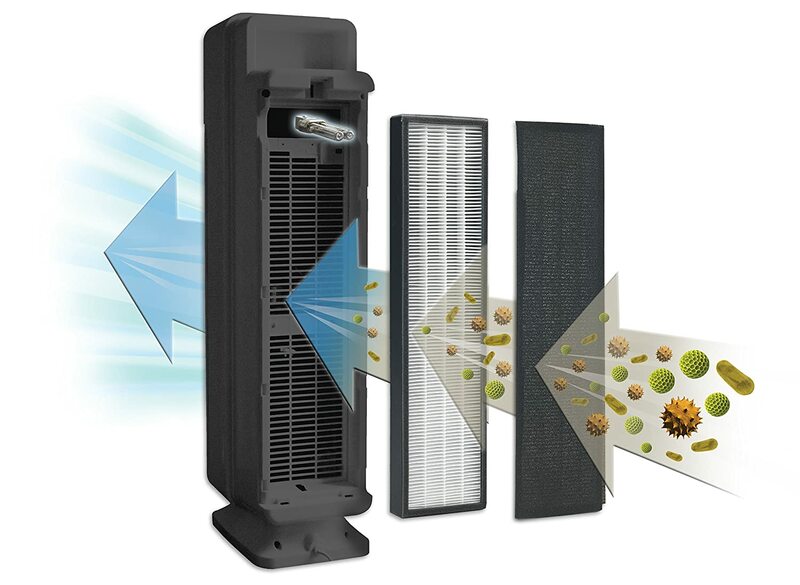 True HEPA filter – GermGuardian CDAP5500BCA uses a True HEPA Filter to capture 99.97% of microscopic allergens, dust and mold spores down to 0.3 microns in size. This filter is including an antimicrobial treatment on it to help prevent against any odors or bacteria from getting trapped in the filter. The GermGuardian CDAP5500BCA is a dazzling performer. I was reasonably impressed with its predecessor, like with the GermGuardian AC4825 or GermGuardian AC4300BPTCA, but an upgrade to the set of filters means a 10% efficiency at capturing odors. For the performance test, I compare the efficiency of this GermGuardian CDAP5500BCA against other air purifiers in the same price range, the Blueair Sense+ and Winix 5500-2. Within the test conditions of 100-sq-ft room and duration of 1 hour, it is apparent that they are all the same, with the highest efficiency of 99.9% for any particles as small as 0.3 microns. The Winix 5500-2 is a bit better with high fan power, has the efficiency of 99.95%. It isn’t the most powerful air purifier on the market by any stretch of the imagination, but it comfortably passes the threshold where such things will be noticeable to most people. With a combination of a great UV technology, GermGuardian CDAP5500BCA can not only trap the allergens, but kill them. Remember that you can use the same filter in previous models like AC5250PT, AC5000, AC5300B, AC5350B. Yes, then you will ask me why you need to purchase this air purifier if it just provides the same performance as the predecessors. Well, if you are not in hurry, just scroll to below. Also, GermGuardian also provides the most affordable filter replacement for their air purifiers, so you won’t need to worry about the cost. It is only $39. However, remember that with extensive using, the True HEPA filter can only last for 6-8 months. This is typically not a strength of any air purifiers from GermGuardian. To reduce the cost as much as possible, Guardian Technologies usually trade off the fan power for the powerful air filters and great smart features. That being said, you will have a decent air purifier for 167 sq ft. The ACH of GermGuardian CDAP5500BCA is 4X. Despite of the relatively weak fan power, the air changes per hour rating is okay. The CADR of GermGuardian CDAP5500BCA is 114 Dust/ 108 Smoke/ 127 pollen (cfm). For a small room air purifier, this CADR can cope really well. But to compare with other air purifiers with same price range like Levoit LV-PUR131, AeraMax 200, Honeywell HPA300 or Coway AP-1512HH, both the CADR rating and room coverage are clearly not the competition edge of GermGuardian brand. With 5 fan speeds, GermGuardian CDAP5500BCA runs quite silently at the low setting. However, moving between other fan speed cause it to make a noticeable noise. And on occasion there are too much noise to handle. This is mostly the time you need to clean or replace your air filters. Even at the lowest setting, the noise level of GermGuardian CDAP5500BCA can reach 40 db, which is higher than most of the normal air purifiers in the market. For example, the AeraMax 300 is only 35 db, the SilverOnyx can be as low as 25 db, or 29 db for Sharp FP-F50UW. At the highest setting, GermGuardian CDAP5500BCA is as noisy as the high fan power Honeywell HPA300. The noise level will be 60 db, and this is the noise level of an air conditioning unit, which is really, really loud. If you are planning to have an air purifier for a quiet space, clearly GermGuardian CDAP5500BCA is not the best choice of yours. A few names to be picked for its noise level at this price range are Levoit LV-PUR131, Winix 5500-2 or Coway AP-1512HH. A good air purifier must be used for a long time to be efficient, and in Breathe Quality I’ve been asked many times: “Do air purifiers use a lot of energy?”. We can all agree that power consumption is one important criteria to review if this air purifier is worth your money or not. With a 5W built-in UV-C bulb, it is hard for GermGuardian CDAP5500BCA to consume less energy than other air purifiers. In fact, it can reach 60W power consumption, and this air purifier is nowhere near the energy-saving Levoit LV-PUR131, Winix 5500-2 or Coway AP-1512HH. For using a GermGuardian CDAP5500BCA 8 hours per day, it would cost you up to $22 per year. Though the power consumption is not really as low as others, the GermGuardian CDAP5500BCA is still an Energy Star rated device, and you can use it without worrying about the power consumption. If there is a true competitive edge for this GermGuardian CDAP5500BCA, it should be the fantastic additional features. You are looking at a true Wifi Smart air purifier under $200, and in fact, the GT app works its best to deliver a smart control with GermGuardian CDAP5500BCA. Moreover, you can also control and monitor your air purifier using the Bluetooth function. Another smart feature is the Alexa communication. However, I find this function on my testing unit quite bad and sometimes, it doesn’t work at all. Also, GermGuardian CDAP5500BCA features the Smart Sensor to help you indicate the real-time air quality, then automatically adjust the fan speed. With these additional features, we could easily fall for this air purifier and add it in the high-end level. Being the flagship tower air purifier of the most affordable brand, GermGuardian CDAP5500BCA has a much better additional features than previous models. If you expect a Smart air purifier under $200, it is hard for you to ignore this air purifier, not mention its powerful air filter process with both True HEPA and UV-C light filter. However, with an increase in the price and there is no much improvements from the predecessors, I prefer to stick with GermGuardian’s older models. Should I buy GermGuardian CDAP5500BCA? Yes, especially when you get the discount code for this low-end smart air purifier (and you will find it here quite often). If you have serious allergies or asthma to airborne pollutants: the GermGuardian CDAP5500BCA is powerful with its 3-stage air cleaning system. If you need an air purifier with a better room coverage: you can choose the Alen Paralda or Alen T500 with manufacturer’s suggested room size of 500 sq ft. The Oransi Finn can also clean a room of 400 sq ft, too. The GermGuardian CDAP5500BCA offers smart features and powerful air filtration for under $200, making its weak fan power easier to stomach. But since the performance rating is not better than previous devices, why should we opt in for this air purifier.